MISSION, KS--(Marketwired - Apr 3, 2015) - (Family Features) This year, recognize dad with the gift he's really looking forward to receiving -- a feast fit for a steak-loving king shared with family and friends. Fire up the grill and serve up robust, savory cuts, such as Omaha Steaks T-bone or Rib Crown selections for your Father's Day celebrations. The T-bone is a thick cut to give you more bone-in strip and butter-tender Filet Mignon for even the heartiest of appetites, while the Rib Crown is carved from the most prized part of the Ribeye and is known for exceptional marbling, flavor and tenderness. Both cuts are grain-fed, aged to perfection and flash-frozen to capture freshness and flavor. Omaha Steaks make the perfect gift, so you can confidently ship them directly to your favorite fellow or grill them up for him at home. For more steak recipes for your Father's Day celebration, visit www.omahasteaks.com. 10. Allow your steaks to "rest" for 5 minutes between cooking and eating. This will help retain moisture when you cut into them. Grill steaks to desired doneness. For medium rare steak, grill for about 8 minutes on first side and 6-7 minutes on second side. Note: To prepare cumin and coriander, toast by placing in dry pan over medium heat, shaking pan about 2-3 minutes until seasonings start to brown. Crush using bottom of pan on cutting board or with mortar and pestle. Thaw steaks overnight in refrigerator or quick thaw by placing sealed steaks in sink with water for 15-30 minutes. Heat grill on high. Blot dry steaks with clean paper towel, then brush each side with cooking oil. Grill steaks to desired doneness. For medium rare steak, grill for about 5 minutes on first side and 3-4 minutes on second side. Serve each steak with vegetables. Roast for 30-40 minutes or until all vegetables are done, stirring once half way through cooking time. This Father's Day, give your dad a gift that ignites his love of grilling. 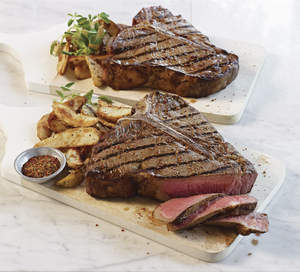 The T-bone and Rib Crown cuts from Omaha Steaks offer up big, meaty portions every guy would be happy to receive. While you're honoring your dad, be sure to visit www.RemarkableDads.com for quotes, stories and other Father's Day inspiration.